Pricing Information: Lunch and lecture fee &#8211 $20 members/$25 non-members. Register for three or more Food for Thought programs at once and receive a discounted price of $18 members/$23 non-members per program. Call (607) 547-1461 with questions regarding pricing or the cancellation policy. On September 29, the New York State Historical Association in Cooperstown, New York, will host a second annual Americana Symposium. This year the theme is &#8220Civil War Era Material Culture&#8221- the event will be held at the Fenimore Art Museum from 9am until 5pm. The symposium brings together leading scholars and experts on American history, art, and culture. After morning speaker sessions and an optional buffet lunch at noon, the 77th New York Regimental Balladeers perform in a special presentation, &#8220Hard Times Come Again No More: America’s Heart Songs&#8221. The balladeers preserve the songs, tunes, history, and spirit of the Antebellum and Civil War period using original musical arrangements and lyrics. Symposium attendees also have the opportunity to explore the Fenimore Art Museum and The Farmers’ Museum. Cooking demonstrations take place at The Farmers’ Museum, and a reproduction regimental silk flag will be painted at the Fenimore Art Museum. The symposium coincides with the Fenimore Art Museum’s exhibition, On the Home Front: New York in the Civil War, which runs from September 8 through December 31, 2012. The exhibition features Civil War–era artifacts, artwork, photographs and clothing. The public is invited to explore the exciting world of Americana. Registration is limited and is $65 for NYSHA members and Archive Partnership Trust members, $75 non-members. For a complete schedule or to register online, visit FenimoreArtMuseum.org or call (607) 547-1453. Admission: adults and juniors (13-64) is $12.00- seniors (65+): $10.50- and free for children (12 and under). Admission is always free for NYSHA members, active military, and retired career military personnel. Members enjoy free admission all year. Food for Thought, the popular lunch-and-lecture series at the Fenimore Art Museum, unveils its programs through July, offering an in-depth understanding of the museum’s new exhibitions, including American Impressionism, photography, and Native American art. The2012 series kicks off on April 11 with Between the States: Photographs from the American Civil War, taking a close look at photography’s relationship to the war. Join Michelle Murdock, Director of Exhibitions, for a discussion and tour of Between the States: Photographs from the American Civil War, a traveling exhibition from the George Eastman House. This exhibition of historical photographs commemorates the 150th anniversary of the Civil War and includes photographs by George Barnard, Matthew Brady, and Alexander Gardner. Come for an inspiring walk through our nation’s tumultuous struggle. Explore how Haudenosaunee people have used various materials, techniques, and concepts to communicatetheir identity and express what holds importance in their Native culture. Eva Fognell, Thaw Collection Curator, guides you through A Lineage of Iroquois Artistry for a glimpse into the amazing artistry of the Haudenosaunee people both past and present. Meet artist Kevin Gray as he discusses and guides you through the exhibition of his tintypes, Reclaiming Gettysburg. This exhibition and talk address the human connection to the American landscape and explores the themes of history, nostalgia, and memory through art mediums from digital to tintypes. The Fenimore Art Museum welcomes back To Great Acclaim: The Homecoming of the Thaw Collection of American Indian Art after its national tour. Thaw Collection Curator Eva Fognell highlights the exhibit’s stellar artifacts, which have won accolades across the nation. 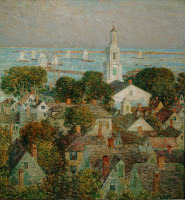 Paul D’Ambrosio, President and CEO, shares his expertise of American Impressionism: Paintings of Light and Life. This discussion and tour emphasizes the influence of Claude Monet on American artists including Childe Hassam, William Merritt Chase, John Twachtman, and Mary Cassatt. Chris Rossi, Associate Curator of Exhibitions, will present Heavenly Aida: Highlightsfrom the Metropolitan Opera and Spellbound: The Metropolitan Opera’s Armide. Exhibition artifacts from the Metropolitan Opera’s archives compliment the mock-ups from the dynamic Glimmerglass Festival 2012 summer productions. Lunch and lecture fee: $20 members/$25 non-members. Register for three or more Food for Thought programs at once and receive a discounted price of $18 members/$23 non-members per program. Please call (607) 547-1461 if you have questions regarding pricing. Registrants who cancel before noon on the Friday before the program will receive a full refund. Registrants who cancel after noon on the Friday before the program will not receive a refund unless the participant’s spot can be filled. If the Fenimore Art Museum cancels a program because of weather, insufficient registration, or any other reason, registrants receive a full refund. The Farmers’ Museum and the Fenimore Art Museum in Cooperstown offer children week-long programs this summer with a unique, hands-on way to experience the museums. Specially designed activities allow participants to see, touch, and do something out of the ordinary. The museums are now taking reservations for three programs in June and July, which run Monday through Friday. Program sizes are limited, so reservations are required. Please call (607) 547-1461 to reserve your child’s spot. For more information, call or visit FarmersMuseum.org. For ages 5-6: June 25-29, 9:00 a.m.-12:30 p.m.
For ages 7-8: July 23-27, 9:00 a.m.-12:30 p.m.
For ages 9-12: July 16-20, 9:00 a.m.-3:00 p.m.
For ages 8-11: July 30-August 3, 9:00 a.m.-3:00 p.m. The Fenimore Art Museum in Cooperstown, New York will open a new exhibition on September 24 titled Unfolding Stories: Culture and Tradition in American Quilts, organized by renowned quilt scholar Jacqueline M. Atkins. The exhibition will be on view through December 31. This marks the first time in over 15 years that the Fenimore will display selections from its substantial collection of historical quilts some dating from the early 19th century. The exhibition explores the many connections that are made throughout and across cultures through the art ofquilting, as well as how these connections have changed over time and place. Almost every culture offers some form of quilting within its textile tradition, yet only in the United States do we see a confluence of traditions, cultures, ethnicities, and innovations that produces the richly diverse quilting culture that exists today. On view will be approximately 24 quilts distinguished by their design, pattern, and workmanship. The quilts are organized to examine six themes ranging from the history and inventiveness of this time-honored practice to the role that quilts play in revealing values, culture, traditions, and beliefs. Unfolding Stories pieces together this intricate patchwork of diverse connections into a fascinating narrative that grows out of stories embedded in the quilts themselves. Quilts on display include pictorial narratives, one-patch designs, crazy quilts, cut-outs, star quilts, and signature quilts. “Unfolding Stories looks at how various cultures interpret different designs within the quilting tradition,” remarked Director of Exhibitions at the Fenimore Art Museum, Michelle Murdock. “It demonstrates how cultural and cross-cultural connections are made through design processes as well. Quilts continue to provide visually powerful yet ever-changing texts for us to read, interpret, learn from, andenjoy,” Murdock added. 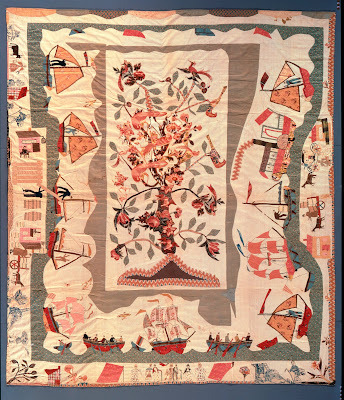 Also included are the three award-winning quilts from The Farmers’ Museum’s 2010 New York State of Mind Quilt Show. The exhibition is sponsored in part by Fenimore Asset Management. The exhibition will compliment the many folk art related activities taking place this fall at the Museum including the exhibition Inspired Traditions: Selections from the Jane Katcher Collection ofAmericana opening October 1. Join us across the street at The Farmers’ Museum for this year’s A New York State of Mind Quilt Show – October 8 and 9. 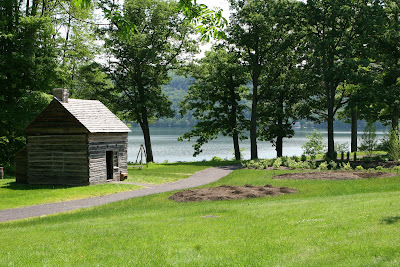 The Fenimore Art Museum’s 2011 Americana Symposium will be held on September 30 and October 1. This new annual event will bring together leading scholars and experts on American history, art, and culture. Photo: &#8220Trade and Commerce&#8221 Quilt Top by Hannah Stockton Stiles (b. 1800), ca. 1835. Possibly Delaware River Valley. Cotton, cotton chintz. 105 x 89 in. Gift of Hannah Lee Stokes. Fenimore Art Museum, Cooperstown, New York. 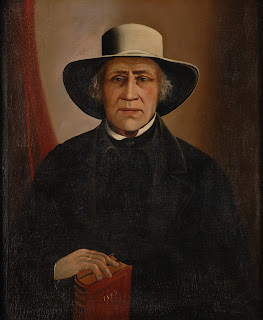 On September 30 and October 1, the Fenimore Art Museum in Cooperstown, New York will host an Americana Symposium, “Inspired Traditions.” This new event, which is expected to be an annual occurrence, will feature distinguished scholars who will present their research on a variety of topics represented by the Jane Katcher Collection of Americana – a privately held folk art collection – as well as the folk art collection of the Fenimore Art Museum. Presenters include Robin Jaffee Frank, David A. Schorsch, Robert Shaw, and other folk art and Americana specialists including Jane Katcher, Dr. Paul S. D’Ambrosio (President and CEO of the New York State Historical Association / Fenimore Art Museum and The Farmers’ Museum), Eva Fognell (Curator of The Eugene and Clare Thaw Collection of American Indian Art), Richard Miller, and Robert Wilkins. The symposium will coincide with the opening of the Fenimore Art Museum’s fall exhibitions &#8211 Inspired Traditions: Selections from Jane Katcher Collection of Americana and Unfolding Stories: Culture and Tradition in American Quilts. Both exhibitions run through December 31, 2011. A new book, “Expressions of Innocence and Eloquence, Selections from the Jane Katcher Collection of Americana, Vol. II” will also be released at that time. The symposium schedule includes a welcome reception and attendee dinner on Friday, September 30. On Saturday, October 1, there will be morning and afternoon speaker sessions with a buffet lunch at noon. Attendees will also have time to explore the Fenimore Art Museum and The Farmers’ Museum. Fee: $75 ($65 New York State Historical Association members). For a complete schedule or to registeronline, visit FeninmoreArtMuseum.org/symposium or call (607) 547-1453. 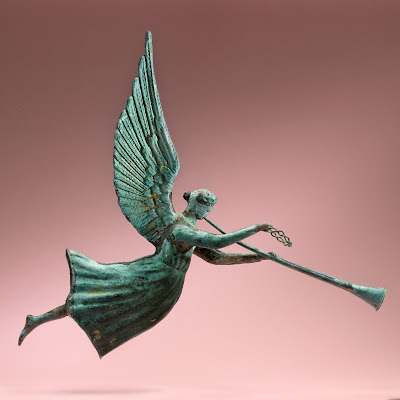 Photo: Flying Fame weathervane, Possibly New York, circa 1880–1890. Copper, zinc, traces of original gold leaf, verdigris, 30 ? 31 ? 12 inches. The Fenimore Art Museum in Cooperstown, New York will host the 8th Contemporary Iroquois Art Biennial: 4 Artists Under 30 – opening Saturday, August 27. The exhibition will feature the work of four young women from the Haudenosaunee, or Iroquois, Confederacy: Lauren Jimerson (Seneca)- Awenheeyoh Powless (Onondaga)- Leah Shenandoah (Oneida)- and Natasha Smoke Santiago (Mohawk). The exhibition was organized by guest curator G. Peter Jemison and will be on view through December 31, 2011. These four young women are influenced by their heritage as Haudenosaunee but have also sought unique ways to express their individual vision &#8211 incorporating music, three dimensional objects, castings, as well as traditional methods to bring their work to life. Awenheeyoh Powless, a recent graduate of the Rochester Institute of Technology, has incorporated Iroquois music and traditional dance steps to create paintings with her feet on un-stretched canvas &#8211 using foot movements to apply the acrylic colors. Leah Shenandoah, another recent graduate of RIT, has focused on three dimensional objects that are across between sculpture and painting. The objects are made of stretched fabric on a wire frame to which paint has been applied as a stain. They are exhibited hung from the gallery’s ceiling in a grouping. 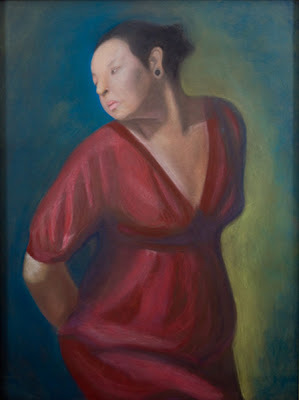 Lauren Jimerson, currently in her final year at RIT, uses pastel on paper to create portraiture. Natasha Smoke Santiago, a self-taught artist who has been actively exhibiting her art since she was a teenager, casts the bellies of pregnant women and then forms the casts into sculptural objects incorporating traditional Haudenosaunee craft techniques. The bellies are turned into pottery or elaborate baskets with materials resembling splints. Image: Pastel on paper by Haudenosaunee artist Lauren Jimerson.